Sound strongly influences our well-being, yet its nature, aspects, and the processes through which it affects our minds in positive, negative, or neutral ways, are unknown to most of us. 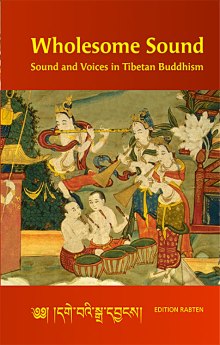 On this CD the chanted recitations of the monks of Rabten Choeling Monastery produce sounds, which, because of the power of the monks’ prayers and meditation, produce a clear and wholesome state of mind in the listener. The immensely informative booklet which accompanies the CD guides the listener to a deeper understanding of the functions of sound.